It’s been stormy all day. Poor Tommy. He hates the rain, but his wild energy needs to be burned off or he'd drive the cats and me crazy. So, we stepped out into the pouring rain in the last hours of daylight. After about 30 minutes, the rain started coming down in sheets, and the wind kicked up. It was kind of scary. 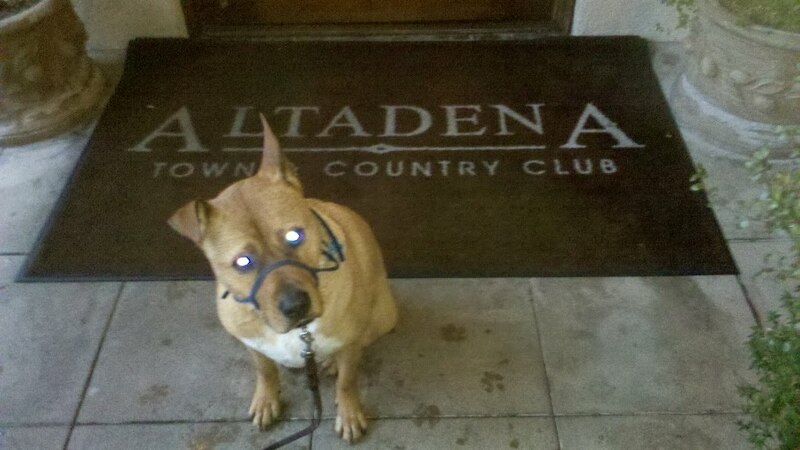 So I ducked for cover at the Altadena Country Club. The flags cracked in the wind, a sound that made me think of Pasadena Adjacent. She always posts cool video clips with interesting sights and sounds. So I turned on my Droid’s camcorder app. Unfortunately it’s been years since I’ve videotaped so I’ve forgotten the essentials, like not turning the camera sideways. This is god-awful, but it stars Tommy. And even a sideways Tommy is worth viewing. I have an idea what he’s eating–or trying to eat–when he licks the cement patio. What’s your guess?